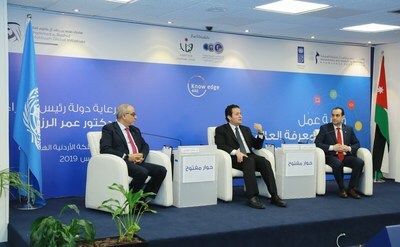 DUBAI, UAE, April 9, 2019 /PRNewswire/ -- The Mohammed Bin Rashid Al Maktoum Knowledge Foundation (MBRF) and the United Nations Development Programme (UNDP) concluded Knowledge Week Jordan, held on March 24-28, 2019, in Amman, in collaboration with the Jordanian Ministry of Youth and Abdul Hameed Shoman Foundation. Jordan’s Minister of Youth (in the middle) participating in “the Open Discussion Session” at the end of Jordan’s Knowledge Week. Findings of the Global Knowledge Index 2018 were announced at the event, where prominent Jordanian universities and 750 college students attended, exploring ways to improve Jordan's scores along the Index's seven sectors: pre-university education; higher education; vocational training; research, development, and innovation; information and communication technology; economics; and enabling environments. Several workshops were announced as part of MBRF's "Know Talks" programme, launched by MBRF during the Knowledge Summit 2018. Meanwhile, Knowledge Week Jordan kicked off with a series of workshops at the Hashemite University and the University of Jordan, followed by a Knowledge Retreat for youth in all 12 provinces of the kingdom. An official spokesperson for the Jordanian Government asserted its intentions to benefit from the Retreat and the Knowledge Report to avoid falling behind on the Fourth Industrial Revolution, as did the Ministry of Culture. Organised by the Abdul Hameed Shoman Foundation in collaboration with the Ministry of Youth and under the patronage of Jordanian Prime Minister H.E. Dr Omar Al Razzaz, the three-day Retreat urged participants to outline plans that address obstacles to establishing a knowledge-based society in Jordan, calling for a collaborative relationship between scientific research centres and knowledge institutions. The workshop also shed light on the accomplishments of the UNDP-MBRF partnership, particularly, the Future of Knowledge Report, which provides a new data-powered knowledge-measuring tool, and a pilot survey covering 20 countries and exploring sectors that will shape the knowledge societies of the future. The workshop concluded with a dialogue on "Media as a Source of Knowledge", and a discussion around Jordan's results in the Global Knowledge Index. MBRF and UNDP also announced that two of the teams participating in the workshop had won an opportunity to attend the Knowledge Summit 2019 in Dubai and participate in setting its topics of discussion. The Knowledge Week initiative is a continuation of the Knowledge Summit and by taking the event around the world, MBRF and UNDP hope to spread the findings and recommendations of the Global Knowledge Index, and foster a meaningful exchange of knowledge, expertise, and best practices.